Howard Moore, New Zealand Tree Grower May 2015. In 2011, Dawoon Park at the University of Canterbury studied the economic profitability of 51 small-scale radiata pine forests. Her research showed that the prospects of getting a satisfactory return from many maturing woodlots were bleak. This conclusion was in stark contrast to the halcyon days of the early 1990s, when 10 hectares of radiata pine could be worth as much as a million dollars. The steeper the terrain, the more difficult the access and the further from the port, the less profitable will be the forest. Using 2011 costs and log prices, taking the actual slope and transport distance into account and assuming a 30-year rotation, Dawoon estimated that 10 per cent of the forests which she sampled in the Wanganui region would produce negative stumpages. When she added overheads and land rental costs to the mix, she calculated that 47 per cent of the forests would make a negative rate of return, while the other 53 per cent would make an average rate of return of only 1.4 per cent each year. Dawoon noted that the costs used in her analysis were generally higher than those presented in parallel studies because she focused on small-scale forests while they used cost and income from large-scale forests. Size made the small-scale forests less efficient to harvest. Dawoon’s observation reinforces the arguments of the previous article by Hamish Levack who explains that unless a small-scale forest owner obtained potential economies of scale across the full commodity chain, the stumpage foregone could turn any profit into a loss. With more than 11,000 forest owners nationwide each with less than 40 hectares, the potential of that lost margin could be over $1.5 billion. In addition, those small growers losing money on their forests might leave the industry and not replant, with future consequences for land use, carbon sequestration and wood supply. Sell cutting rights into a company. Competition among such companies potentially keeps fees low. Competition among service providers is low if there are too few to cope with all the wood which needs harvesting, which is the situation I expect from 2020 to 2030 as growers try to harvest and market the ‘wall of wood’ planted in the 1990s. In the 1930s a few large companies dominated the wood market in Scandinavia. Private forest owners decided to collectively negotiate better log prices by banding together and offering buyers much larger volumes of wood. They were successful in increasing prices and they later successfully countered the power of industry by constructing their own processing plants. A main factor in their success was the approximately normal age class distribution of their collective forests. This meant that the cooperative needed to provide only small incentives to members, more than offset by the benefits received, to secure a steady and continuous supply of wood for its customers, and its service providers were guaranteed continual work. The profit from the reduced costs and increased income associated with the guaranteed supply was distributed back to the cooperative members. This model was sufficiently attractive to encourage practically all small-scale forest owners to join. The cooperative can provide useful information and education to members. The disadvantages are that this sort of cooperative works well if it has sufficient members to provide a regular cut from an even mix of forest age classes. However, with harvesting decisions made by individuals, and with relatively small numbers of members, no cooperative of this type in New Zealand has been able to guarantee a sustainable log supply. This has made it impossible to sell logs at a price premium, or to attract investment in the cooperative to process its own logs. In addition, the costs of administering such cooperatives can be significant. The cooperative could provide useful information and education to members. If a member sold cutting rights into the coop the cost-of-bush taxation anomaly would apply, which could mean a substantial extra expense. There are possible ways of avoiding this such as the use of derivatives or conditional sale and purchase agreements but there are risks that the government would frown on these alternatives. In return for cash and or shares, small-scale forest owners could sell their cutting rights to a company which would then organise the timing and area of harvest and all associated logistics, including trucking, wharfage, marketing and shipping. In 2003 Wrightsons proposed this model, in what they termed ‘a single asset forest company.’ Unfortunately it was not successful, possibly because most of the small-scale forest owner estate was then still 15 to 20 years away from harvest and it was difficult to achieve critical mass. 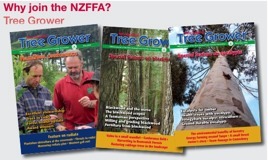 In August 2014 United Forestry Group was launched with a slightly different business model to fill this niche. It aims to buy cutting rights and aggregate small-scale forests into regional clusters that can be harvested as estates. While it is early days, several growers have expressed interest in joining such clusters. A company is simple and relatively cheap to administer. The grower would lose control of the timing of harvest although this might not be significant as in many cases harvesting would be contracted to a third party who would schedule it to suit his own capacity, taking the decision away from the grower. The company would have a natural incentive to obtain economies of scale, but any sharing of that benefit with growers with an upfront cash purchase in advance of the realities of harvest would be discretional. The cost-of-bush taxation anomaly would apply as mentioned above. Many small-scale forest owners may get nothing back from harvesting and marketing their forest blocks. This may lead to further declines in productive forest area, with implications for land use, carbon sequestration and future wood supplies. 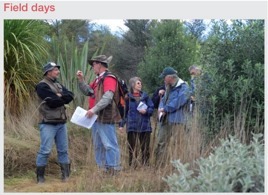 It is in the interests of the individuals, the industry and New Zealand as a whole for small-scale forest owners to work collectively to maximise the profitability of these forests. At present existing service providers offer the only practical way of achieving economies of scale through aggregation. It will be reassuring if the UFG model proves successful and widened the choices available to small growers, before the ‘wall of wood’ made life even harder. Howard Moore specialises in forests as financial assets.